The ML25LT 2C and 3C flashlights are ultra bright and compact industrial strength flashlights renowned for their quality, durability and reliability. Great for professional or everyday use. The Defiant Penlight and Mini Flex Light Combo (3-Pack) is made of durable black and silver anodized aluminum to resist corrosion. The 50-lumen penlight has a 2-hour runtime and 35m throw, amazing feature for a small and compact light. The 10-lumen mini flex light with a 12-inch flexible cable extension is ideal for illuminating hard to reach areas. With a 3-hour runtime and 10 m throw, this mini flex light will be your go to home or car emergency light. Lightweight and convenient, the three penlights can clip to a belt or pocket. The combo pack provides a great value for three pen lights that can be stored in your car, kitchen drawer, shed, or office. The iGlow 30 LED Mosquito Bug Lamp is a multi-purpose lantern perfect for camping or any outdoor adventure. Features a convenient hanging hook and lightweight design. Made of durable, waterproof plastic. Light up the night with 30 ultra bright LED bulbs and three brightness levels. Impressive built-in micro USB charging and mosquito killer. Mag ML25LT 2C/3C Led Bonus Pack The ML25LT 2C and 3C flashlights are ultra bright and compact industrial strength flashlights renowned for their quality, durability and reliability. Great for professional or everyday use. Mag ML25LT 2C/3C Led Bonus Pack is rated 4.5 out of 5 by 102. Rated 5 out of 5 by Peppermintpatty from Like smaller 2C & 3C size. Great bright adjustable light.... Like smaller 2C & 3C size. Great bright adjustable light. 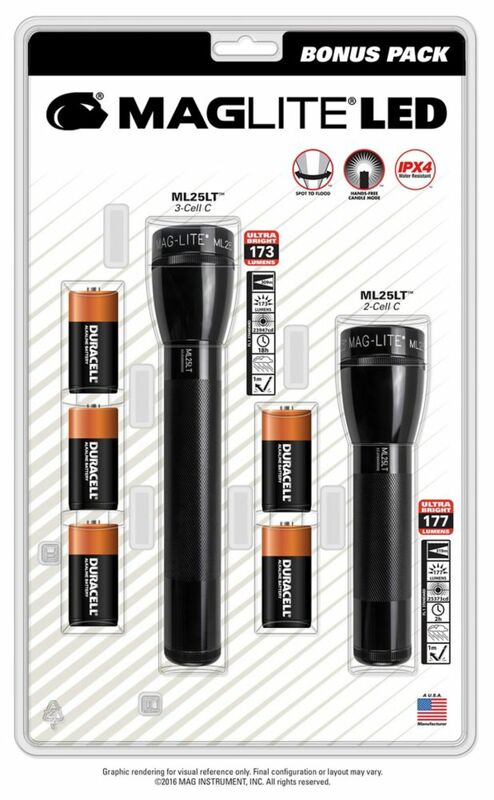 Rated 5 out of 5 by Marcus from I found these Maglites on clearance so I got 2... I found these Maglites on clearance so I got 2 of them. Yes I like these lights.